Grind raw liver with meat grinder. Run onion and a slice of bread through the grinder. Add egg, salt, pepper and lemon zest to mixture. Stir and let rest 5 minutes. Bring clear beef soup stock to boil. 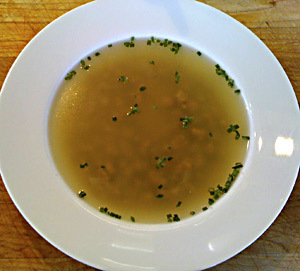 Despite its name, this soup is served in some of Europe's finest restaurants. The dumplings are light and flavorful. When this soup was served at my mother's mountain restaurant in Aspen, people would grimace when they heard the name. My mother would give them a sample taste and, without exception, they would ooh and ahh and order a bowl with astounded praise. The following 10 people in the food line would order the soup. When a new group of people would be passing through, the scene would repeat again and again all day. The soup was always a big hit. Many people suggested changing the name for such a glorious soup, but even then, the inclination would be to ask what tyhe soup was made with and the liver would have to be revealed, so it was decided the name would stay and the tastings would continue. If you've always hated liver, this soup will change your mind. These dumplings have a light, smooth texture and are not at all "liver-y." The bread is used to purge the last of the liver through the meat grinder. A meat grinder is a simple attachment for the front of a stand-up mixer like a KitchenAid. You can also make elegant mini-dumplings with a Spaetzle Grater. See the video. Spaetzle graters are listed in our Cookware section.